Do Wake Up Lights really work? Actually... yes, as you will soon see from the evidence below. However, with the initial claims that Phillips make with regards to "revolutionising the way we approach our sleeping routine" with these 'wake-up alarm lights' that offer us numerous benefits such as helping you to get of bed and significantly improving your energy levels -- all through just changing some lights -- you would be easily forgiven for being somewhat skeptical (as indeed I was). But before, we start delving into some proof, let's firstly just clarify 'how these wake up lights' work -- by taking the HF3520 for instance (a very popular Phillips wake-up light model). Let's say you wanted to wake up at 7:00 AM, how the HF3520 would approach this -- is that at 6:30 AM (well actually you have the option to choose between 20 mins (6:40 AM) and 40 mins (6:20 AM), but for example's sake we will say you chose 30 mins) it would start to emit soft red lighting and gradually work its way through (20 different light intensity levels) to bright bold yellows upon 6:59 AM. This is effectively mimicking a sun rise. In addition, to this you will also get a 'nautral' (e.g. wind chimes, birds tweeting) alarm sound that builds up over 90 seconds until it reaches a peak level at 7:00 AM. As you can see, both these instruments act to 'gradually' and 'calmly' (sort of tricking your body) wake you up 'naturally', which in turn allows you to be in a healthy state of mind upon awakening. Now, if we compare this to the standard method of getting ourselves to wake up: through shocking our bodies into an almost immediate state of ultra-stress with a jarring alarm clock (which logically thinking about it -- of course it isn't a great way to start any day or actually anything really), it seems rather obvious that the former is a far better method of getting ourselves up in the morning. (Note: specifically with the HF3520 model, you can also simulate a sun-set too, through its 'dusk setting feature' which helps those who struggle to get to sleep). 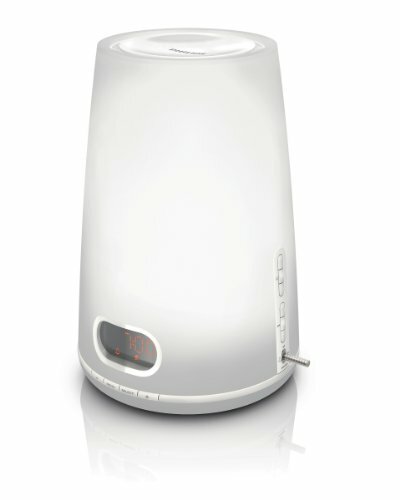 Firstly, it has been independently clinically proven through numerous studies: where specific tests not conducted by Phillips themselves have demonstrated that Wake Up Lights have indeed accomplished the benefits stated such as : Gimenez et al. (2010) -- Chronobiol (Int 27, 1219-1241), Van De Werken et al. (2010) -- J Sleep Res (19, 425-435), -- initial & additional studies that overlap: Partonen et al. (2000) -- J Affect Disord (57 1-3, 55-61), Avery et al. (2001) -- Acta Psychiatr Scand (103 -4, 267-74), Gordjin et al. (2012) -- J Affect Disord (136, 72-80), Anderson et al. (2009) Acta Psychiatr Scand (120, 203-12) & Meesters et al. (2006) & Gickman et al. (2006) -- in prep & Biol Psych (59, 502-507). (For links to each paper, see biblography below). Moreover, it has been certified by the National Sleep Foundation as an effective means of getting better quality sleep. 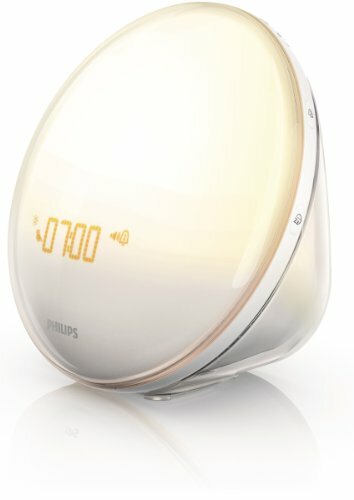 David Cloud, CEO of the National Sleep Foundation had the following to say "We are delighted to be working with Philips on this exciting sponsorship" and "The Wake-up Light, in conjunction with the simple guidelines found in the Sleep Pyramid, can help people and improve their overall sleep and waking habits. Good sleep hygiene includes better appreciation of and exposure to light at the right time of day." But, most importanly have the wake-up lights have proven themselves as products amongst consumers? Yes. If you check out the majority of reviews on most models within their range, for instance on Amazon.com (where they have literally no reason to be biased), they have ratings of around 4.4 out of 5 stars (which as a typical Amazon user, is actually very good) with well over a hundred reviews (e.g. at the time of writing this the HF3470 model has 952 customer reviews and 555 gave it 5 stars, 248 gave it 4 stars -- almost 85%). In all, it is clear there is a great deal of substance behind what the wake-up lights do, but the only way you know if it works for sure for you is to go ahead and get one for yourself (if you honestly don't feel like it works for you, you can always send it back). Granted, they are a fair bit more expensive than your usual alarm clock but with the (priceless) benefits they offer in return -- they are defintiely worth it, no question. Let me know, if you decide to get one and which one if you do (and experiences with it) & if not, then why not? Also, if you have any questions, comments or concerns regarding either the overview article on 'Do Wake-Up Lights work?' or about any of the models mentioned above e.g. the HF3470 or the HF3520, then please do not hesitate to make them in the comments section that you should be able to find just below the fold and we will be sure to respond to you as soon as possible.